Hidden Springs Cafe, a haven to bikers, a coffee stop for commuters and a home to owner Jim Lewis and his family, has been consumed by the wildfire raging through the Angeles National Forest, authorities confirmed Tuesday. 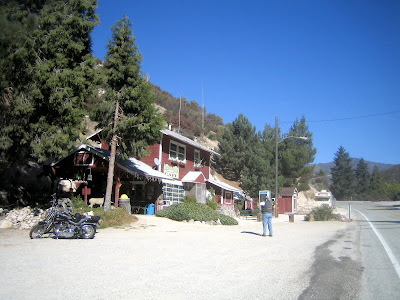 I always liked stopping there while riding through the Angeles National Forest. I'm not sure it was the "haven to bikers" that the Times called it, though certainly a lot of motorcycles stopped there. 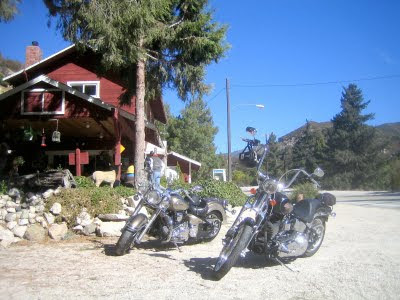 Otherwise, Newcomb's Ranch, another 20 miles up the Angeles Crest is where the biker haven is. But if you wanted to get away from the squids, the wannabes, and the goons, Hidden Springs Cafe offered such a respite. The cafe had a lot of charm that you wouldn't find elsewhere. Hanging from its roof were hummingbird feeders, and the hummingbirds were always there in numbers. In fact, I used to call the place "Hummingbird Cafe". The place was adorned with antiques. 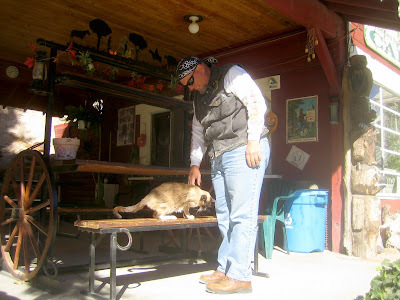 There was also a skinny cat that greeted visitors, perhaps living off of what scraps people would throw at it. I think the reason why more bikers didn't stop there was because it didn't have enough room. While it did have a big parking lot, it hardly had the seating to host a bunch of thirsty bikers. But it had a lot of peace and quiet. You could sit on the front porch, reflect on life, and watch the motorcycles go by. For that, it was a great place to rest. But I guess it's all gone now, reduced to cinders by the "Station Fire".